Former Florida Gov. and Republican presidential candidate Jeb Bush speaks to voters at the Heritage Action Presidential Candidate Forum Sept. 18, 2015, in Greenville, S.C.
On Thursday morning, Republican presidential candidate Jeb Bush told a group of voters at the State Historical Museum in Des Moines, Iowa, that he doesn’t support reauthorizing the Voting Rights Act of 1965. He said that the federal government no longer needs to watch over states’ voting practices “as though we’re living in 1960” because “there’s been dramatic improvement in access to voting, exponentially better improvement.” In other words, Bush believes we’ve come so far in race relations that black people don’t have to worry about having been disenfranchised. While in that museum, Bush should have learned a little history. His comments about the VRA miss the point of the law, put in place to outlaw racial discrimination at the ballot box, and also ignore the impact of new state laws that make it harder for minorities and the poor to vote. 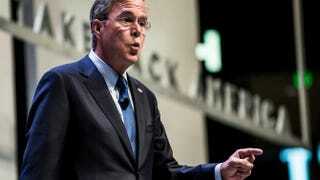 It appears that Bush is trying exceptionally hard to ruin any chance he has of attracting black voters. And he’s succeeding. On the heels of his remark that he’ll appeal to African Americans by giving them hope and aspiration instead of “free stuff,” his stance on voting rights is sure to alienate whatever black support he had left. It’s history redux, with Bush re-enacting the moment in 1964 when Republican presidential nominee Barry Goldwater’s opposition to the Civil Rights Act effectively pushed black voters into the Democratic Party. The 15th Amendment of the Constitution, adopted in 1870, guarantees each citizen the right to vote, regardless of race. States, however, found a way to deny blacks this right by passing Jim Crow laws and requiring them to pay poll taxes or take convoluted literacy tests. The Voting Rights Act of 1965 struck down these barriers and granted blacks access to the voting booth. It also required that states known for racial discrimination receive approval from the federal government before they could change their voting laws. But in 2013 the Supreme Court determined in Shelby County v. Holder that these states no longer had to clear certain laws with the Justice Department before implementing them. The result: A number of states, led by Republican lawmakers, passed new voter-identification laws that have the effect of complicating the voting process for many black voters and those living in poverty. Bush’s comments are proof that he isn’t paying close-enough attention to what’s happening with voting rights in America. For example, Alabama passed new voter-identification laws and recently announced that it’s closing 31 driver’s license offices that just so happen to serve mostly black and poor residents. And North Carolina is currently the site of a voter-identification court battle in which plaintiffs say state rules disproportionately harm blacks. For a presidential candidate who claims he wants to win black votes, Bush is ridiculously tone-deaf on the issue. These laws, which the full Voting Rights Act would have prevented, show that blacks’ right to vote is being abridged in a way that’s more suited to 1960 than today. Bush willfully fails to make this connection. We’ve seen this story before. In 1960, 32 percent of blacks voted (pdf) for the Republican candidate Richard Nixon over the eventual winner, Democrat John F. Kennedy. But in 1964, Republican nominee Barry Goldwater voted against the Civil Rights Act because he objected to the federal government’s regulation of equal treatment of blacks in employment and public accommodation. The result: Black turnout skyrocketed, and 94 percent of those black voters voted Democrat. Today, Bush’s opposition to reauthorizing the VRA is just as wrong and shortsighted as Goldwater’s stance was. Not only will such a position drive a bigger wedge between blacks and the Republican Party, but it is also likely to drive up black-voter turnout in favor of the Democratic Party. In this sense, Bush is not just hurting his chances at attracting black voters; he is also damaging his party’s ability to win the election. Of course, Bush’s comments could just be part of his strategy to appeal to the older, white Republican-primary voters in order to win the nomination. He could move to a more popular, inclusive position once the party nomination is decided. But the self-inflicted damage he’s incurring today may be too much to overcome in the presidential election, if he’s fortunate enough to make it that far. Once again, the Republican Party and its candidates are doing themselves no favors in appealing to black voters. It may be fitting that Bush made such comments in a museum, because not only are they relics of the past, but his chances of winning the presidency may soon be history.